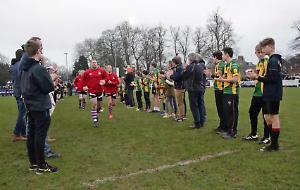 A WALKING rugby workshop for the over-50s was held at Reading Rugby Club in Sonning on Saturday. Two teams of about eight players took part in short games and technical drills. In walking rugby tackling is replaced by a two-handed touch below the waist and there are two-man scrums. A dropped ball, missed pass or forward pass results in possession being surrendered to the other team. Mike Wickson, fixtures secretary at the club, founded the walking rugby programme. He said: “The idea is to play a version of rugby that’s appropriate for people of retirement age. Most rugby clubs provide a form of rugby for everyone from under-fours right up to veterans, which is around 40.